Upon graduation from high school Parris Ashley worked for ten years prior to his enrollment at Frostburg State University. He was 28 years old. While at FSU Parris maintained a 3.55 GPA and went on to graduate in 2015 with a BFA in Painting and a Minor in Art History. Parris Ashley is among several well-known known muralists throughout the region, having won and completed painting contracts throughout the area with his first being in 2012. This consisted of an entire building at the Frostburg Community Pool, with each side having a different theme and tone. Commissions quickly followed with contracts for artwork at Dante’s, Wild Things, Bar Monkey, A Place to Eat (an Alamo depiction) and Grammy’s Attic in Frostburg. A 2015 eighty square-foot mural at the Queen City Creamery in Cumberland depicts the city’s downtown Baltimore Street. Ashley has won several awards, including the 2013-2015 Phillips Art Competition Award and from 2011 through this writing has participated in several exhibitions. His most recent accomplishment, as of this writing, is the completion of the Canal Place Heritage Area mural in downtown Cumberland. The official unveiling of the mural was held on October 14, 2016 and was attended by numerous local and state officials as well as a large turn-out from the community. 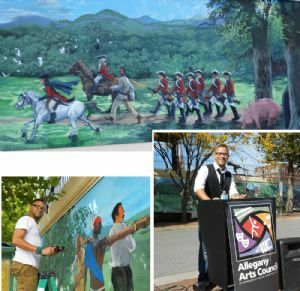 The 200 foot-long mural depicts the history of the Cumberland area and was commissioned by the Allegany Arts Council.